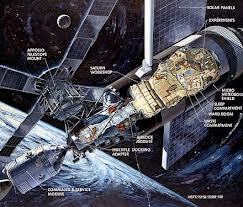 40 YEARS LATER, is Skylab II on the horizon? US: Four decades after the United States’ first space station roared into orbit, a second version of the groundbreaking craft may be on the horizon.NASA launched the Skylab space station 40 years ago Tuesday (May 14), turning the modified third stage of a Saturn V moon rocket into Amerca's first off-Earth astronaut abode. Now, a team of researchers inspired by this recycling ethos has proposed transforming part of another rocket into “Skylab II,” which could become the nation's first-ever manned outpost in deep space. “This one is a big look backwards — 40 years, in fact,” said Brand Griffin, an engineer with Gray Research, Inc., who works with the Advanced Concepts Office at NASA's Marshall Space Flight Center in Huntsville, Ala. The original Skylab supported three manned missions in 1973 and 1974, during which three-astronaut crews lived aboard the station for 28, 59 and 84 days, respectively. The 85-ton station continued orbiting Earth until 1979, when it re-entered the planet's atmosphere and famously rained debris down on a stretch of Western Australia. Nobody was hurt, but the Australian town of Esperance charged NASA $400 for littering. The fine went unpaid until 2009, when California radio DJ Scott Barley took care of it after collecting donations from his listeners. Like the first Skylab, the proposed Skylab II would be built from a piece of a giant NASA rocket — in this case, the Space Launch System (SLS), which the agency is developing to blast astronauts toward asteroids, Mars and other destinations in deep space. Skylab II would make use of the SLS’ upper-stage hydrogen propellant tank, which Griffin said would provide an internal volume of 17,481 cubic feet (495 cubic m) — roughly equivalent to a two-story house, and significantly more than the original Skylab's 12,713 cubic feet (360 cubic m).